What is the difference between a Real Estate Sales Agent and a REALTOR? This is a very critical question that comes up quite often and most people do not realize that there IS a HUGE DIFFERENCE. A real estate sales agent is someone that passed their real estate exam and works for a Real Estate Firm. Not all salespersons are Realtors. REALTORS are held to a higher code of conduct and display the REALTOR logo. REALTORS are held accountable to the Board of Realtors for their actions and are expected to LIVE THE GOLDEN RULE. Realtors will do their very best to represent you with impeccable truth, honesty and morality along with levels of excellence to enable/assist and negotiate you to a fabulous real estate transaction. Realtors hold their license in high regard and will work with YOUR BEST INTEREST IN MIND AT ALL TIMES. It is worth it to any buyer and seller to check the Company and its sales staff that they choose to do business with and make sure that all staff members are REALTORS. Take the time to sit and discuss any questions or concerns you have with your REALTOR of CHOICE. 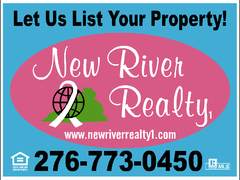 The THINK PINK TEAM at NEW RIVER REALTY1, Inc are ALL REALTORS. We value our clients and customers and we will gladly sit with you to discuss, educate and inform you throughout the real estate process. THE THINK PINK TEAM works as a TEAM with you and we have a mission to make a difference and dare to be different in Todays Market. We advertise on hundreds of Websites to broadcast our listings and provide an extremely comprehensive website to allow you to gather as much information, data and photos of properties which provides you with an incredible on-line shopping experience. LIST WITH US or BUY WITH US! ITS A WIN-WIN SITUATION FOR ALL! CALL THE OFFICE 276 773-0450. WE ARE EXCITED ABOUT MEETING YOU AND WORKING WITH YOU.